The Insurance Institute of Highway Safety named the all-new 2014 Jeep Cherokee a 2013 Top Safety Pick. of 14 Chrysler Group vehicles have been so commended. Top Safety Pick testing simulates a side impact with a large SUV or pickup truck, front moderate overlap impact, roof-crush consistent with a rollover, and a rear collision capable of inducing whiplash. In each of these, the all-new Jeep Cherokee recorded the highest-possible rating of 'good'. "The all-new 2014 Jeep Cherokee represents the pinnacle of innovation in the mid-size SUV segment," said Mike Manley, Jeep President and Chief Executive Officer. 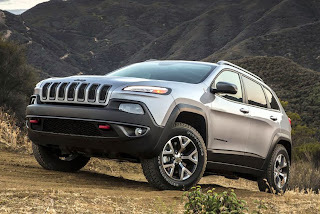 "In addition to the breakthrough efficiency of its unique 4x4 system and the milestone introduction its 9-speed automatic transmission - a world-first - the Cherokee features a host of technologies that combine to deliver outstanding occupant protection. That kind of robust performance delivers on the promise of the Jeep brand."